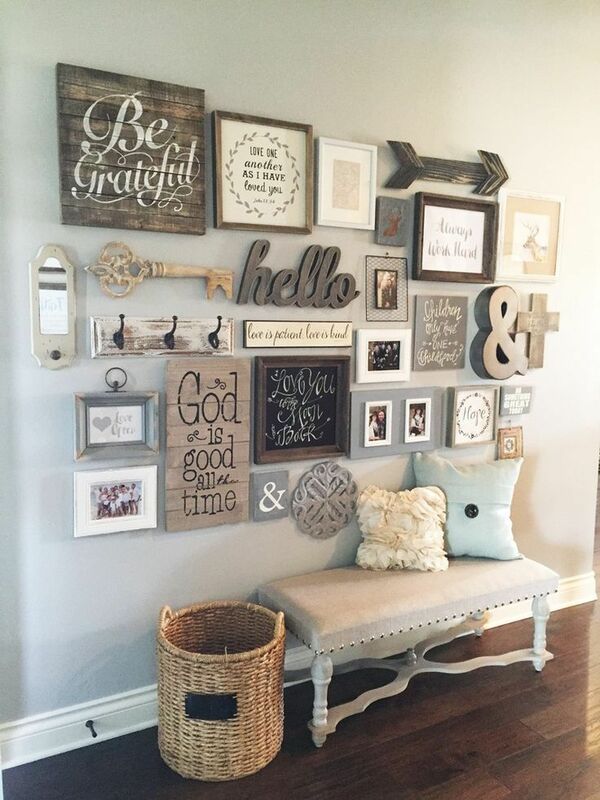 Are you looking for new ways to decorate your house and your house walls? Instead of hiring expensive contractors you can first try work on your own DIY projects and come up with innovative and unique designs. And, if you need further information, we hope that our following home decors will create the atmosphere of calm and serenity you were always looking for. All the products we picked are guaranteed to turn your house into a welcoming place for you and your family. This sun shaped-like mirror is perfect for hallways, bathrooms, living rooms, and bedrooms alike. Its beautiful golden frame goes with a wide range of stylish decorations and luxury furniture and will certainly give an instant glow to your room. It is made of 70% metal, 15% MDF, and 15% glass and can be easily hung anywhere you want thanks to the attached keyhole design. The product is about 25 inches tall and doesn’t require additional assembling for the frame. This unique golden mirror will decorate any wall color and match perfectly with elegant, luxurious, modern or Mediterranean-style decorations and furniture. If you’re looking for a new rustic coffee table to go well with your home decor, this one from Emerald Home could prove a winning choice. The item is made of top-quality hardwood and industrial steel to provide a sturdy and reliable construction with a time patina. The table features a distressed, solid wood planked top and an open shelf made with the same type of wood. It goes perfectly with almost all types of decorations and furniture styles but will really bring into prominence some hard brick walls and an industrial style loft or living room. If you’re looking for a cool way to hang your plants inside the house or keep your favorite books, this bookcase is perfect. It is made of strong MDF and features five fixed tray-style shelves that are wide enough to provide space for storing your favorite books, plants, and home decorations. The product is multifunctional, meaning it can work as a corner bookcase or a simple decor case that can be used according to your needs and imagination. The contemporary design of this bookcase blends well with any type of home decor or furniture in order to create a harmonious look for your room. We don’t know about you, but we think a folding privacy screen is a perfect way to decorate a bedroom or even separate the open-space living room from the dining area. This room divider features four different foldable panels that you can use to create the type of dividing you want. You can use the product to separate your bed from the changing boudoir or even use it as a decorative element in your bathroom. The item features a solid rubberwood frame and opaque rice paper screen for a natural touch. The black color works great with all types of decors. Looking for innovative and fresh ideas to decorate the rooms in your house? This awesome wall decoration container is perfect for creating a hanging terrarium in which you can use a variety of real plants, including air plants, and mini cactuses. The item comes in two different cool colors – brass and copper – and will go perfectly with black or white walls in your room. The attractive and modern geometric design will fit all home stylings and furniture pieces and provide an elegant touch to all rooms. The hanging planter comes in various sizes so you can choose the right one for your room. What better way to display your favorite family memories if not with a set of innovative and cool shelves in the living room? This wall mount corner features five shelves made of durable laminate MDF so it will last a long time from now on. What we like about the product is that it comes in five different colors, including white, natural, and walnut, so it will perfectly match the decors inside your house, regardless of style. The shelves are easy to mount and come with all the necessary hardware. You can use this decoration element in your house or at the office to store your most important memories, including diplomas, degrees or family photos. This small table top is made of real and quality wood and represents a trendy design for any vintage, industrial or countryside decor you might want to have in your house. The table is easily mounted on walls or any other straight surface and can even make a thoughtful gift for your loved ones, neighbors or friends. The product measures 17.75 inches in length, is 1.75 inches wide and about 7 inches tall, so it will be easily noticed by anyone entering your home. In fact, the “home” spelled decoration is perfect to create a peaceful and fresh atmosphere in kitchens, dining rooms or living rooms. This rug comes in various sizes and colors so it will perfectly match the rest of your home design, furniture, and decorations. It is made of quality polypropylene pile fibers that are known for their endurance and durability. This means your rug will look the same even after years of use and cleaning. The bohemian geometric pattern provides both a rustic and luxurious touch to any room you’ll decide to use the rug in. We advise you to place the rug near the sofa or dining area for maximum impact. The piles are 0.375 inches tall. Although natural plants are always preferable, artificial plants are a much better solution when you have pets or small children wandering around the home. They make a perfect addition to places without too much natural light or in any house in which you might want to create a green decor without having to water the plants on a regular basis. In other words, this artificial ficus can be used both in indoor and outdoor locations and will even provide an amazing dorm decoration for a green corner. The realistic design and the quality variegated PVC leaves will leave you daydreaming at a new tropical holiday destination. This natural fiber rug comes in various sizes and colors so you can choose the one that best matches the rest of your house and room decor. The warm and natural tones will complement any type of decor and furniture style to create a welcoming room for you and your guests. All rugs are made of natural materials, including seagrass and jute so they will be great for tradition, rustic, industrial or Mediterranean decorated rooms. What we like about these rugs is that each item is handmade and hand woven so you’ll get an authentic and unique product every time. In addition, they can be used as unique elements to decorate a loft, a beach house or even an outdoor terrace. If you don’t necessarily have the passion for decorating your home, chances are that you find it difficult to find cool room decorations. What is more, this spare-time-job is made even more dreadful given that the market is filled with plenty of various items that are very similar. So, because we know how it is like to be in your shoes, we have decided to lend you a helping hand. Consequently, to spare you of the time-consuming task of looking for cool decorating ideas for your room, we have made a selection of practical aspects and items that you are prone to find feasible. So, keep on reading this following list of suggestions, and you won’t be disappointed. If you are set on redoing your home by changing its decor, we recommend that the first aspect that you spend some time debating is whether you want to purchase already made decorations or, if you want to make them yourself. On the one hand, if know for sure that you are not a particularly handy person or if you don’t have a lot of time on your hands, we believe that it might be best to simply order a few statement pieces online. For instance, you could purchase a beautiful minimalist painting or a set of matching pillows that look good on any couch or bed. Similarly, you could invest in a top-notch reading lamp that can bring the needed plus of light in basically any room of your home. Likewise, you could just as well invest in new curtains, as this is likely to change the way in which your living room looks completely. On the other hand, if you are a fan of DIY projects and you aren’t afraid of getting your hands dirty, we recommend that you go online and that you search for cool craft ideas for your room. For example, you could use your talent to manually paint one wall of a room by drawing an oversized flower in black and white or by writing the words of your favorite poem or song in the corner of your bedroom. However, if you decide to do so, we strongly recommend that you buy quality paint and that you carefully plan the way in which you intend to cover the wall. Even more so, if you feel like you aren’t quite prepared to carry out such a task; we believe that hiring a professional painter might actually be a better idea. Another aspect that should be on your mind before you commit to any changes has to do with if you want to make significant changes to your home or if you only intend to make a few minimal interventions. If you chose the first option, you should consider changing certain pieces of furniture such as your chairs or your sofa(s) and replacing it/them with newer, more comfortable items that also bring a spark of color to your home. Still, if you intend to totally transform the way in which your house looks by removing/adding walls, specialized help is required. If you opt for the latter idea, we advise in favor of playing it safe by purchasing a new cozy rug that is gentle on your feet. Also, you should add fun patterns to your house by investing in central items that can draw one’s attention. This way you’ll have a well-balanced design that is not overdone or too faded. Nonetheless, whatever you decide to do/purchase, you should always pay attention to the way in which the colors combine. This way, you will surely avoid the risk of ending up with a baroque-looking home that is tiring on one’s eye. Even more so, if you own a small house/ apartment, we recommend that you invest in minimalist furniture rather than purchasing items that make a home look congested. Before we end this article, we feel like it is best that we share with you a few extra ideas that will surely help you pick some cool decorations for your room. Firstly, we believe that it is fit that you make sure that you personalize your home. In other words, although might want to settle for a magazine-like look, you should take the time to add a twist that makes the design your own. For instance, you could use an old furniture item and transform it into something else completely. Therefore, your old bench could easily become your new nightstand. Similarly, you could collect your personal favorite photos and use an intricate photo frame to transform them into an art-like wall décor. Additionally, before you decide to purchase anything, specialists recommend that one does the needed research. In other words, you should go ahead and see what previous buyers had to say about a certain product. Also, check to see what price different retailers sell the same product. As a plus, specialized home designers say that those that are on a budget should refrain from wanting to change all the furniture in their home. Instead, the good idea is to invest in key pieces that make the room stand out (an avant-garde painting or a modern dining table). Last but not least, if you want to find the best bedroom decorations you should go online and search for instructions on how to create your own personalized pillowcases, as this will add a pop of uniqueness to your favorite room. 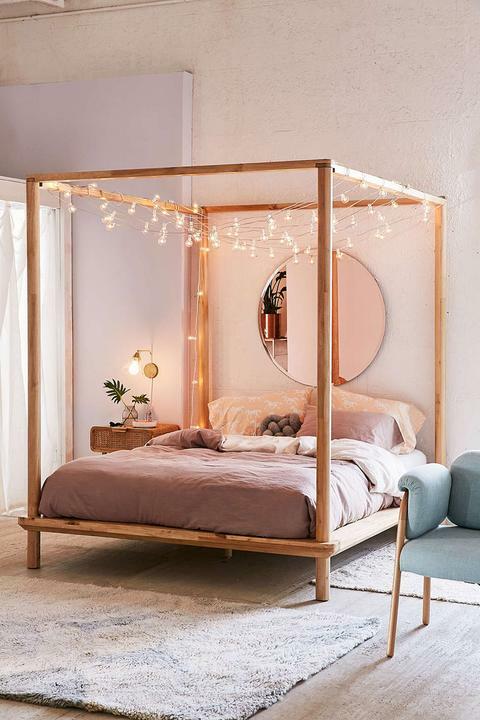 Moreover, you could also use lights to make your bed look more cozy and nice. To do so, be sure to search for step by step guidance by accessing sites that are filled with safe DIY projects.